The mission of Okeanis is to promote the knowledge and skills necessary to manage and maintain functional marine ecosystems for the benefit and prosperity of people and wildlife through technical training, capacity building, research and information sharing. The vision of Okeanis is to develop a new scientific leadership for the study of the ocean and the conservation of marine landscapes. Click here to view Okeanis’ Strategic Planning document for the next three years. 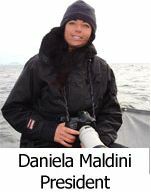 Dr. Daniela Maldini completed her Ph.D. in Zoology at the University of Hawai’i at Manoa in 2003. She also has an M.S. in Marine Sciences from San Jose State University (Moss Landing Marine Labs) and a B.S. in Biological Sciences from the University of Pavia, Italy. She completed a Post-Doc in Conservation Biology at the Center for International Educational Exchange, Marine Research Station Bonaire, Netherland Antilles and she is a faculty member with the International Honors Program. She has been involved in a variety of ecological studies focusing on whales, dolphins, sea otters, and pinnipeds from the Mediterranean, to Mexico, to Alaska and the Russian Far East. She has been studying marine mammals in the California coastal ecosystem since 1990. 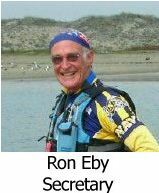 Ron Eby first came to the Monterey Peninsula in 1972 as a student at the Naval Post Graduate School. After retiring as a Navy commander in 1989, Ron returned to Monterey to begin a second career in video teleconferencing, and retired in 2004 to turn his energies into volunteering. He is involved with TeamOCEAN, Bay Net, ESNERR (Elkhorn Slough National Estuarine Research Reserve), and the Pelagic Shark Research Foundation. Ron is currently the lead staff for TeamOCEAN, a seasonal field program that provides kayak based face-to-face interpretation of the Monterey Bay National Marine Sanctuary’s natural history and programs, as well as guidelines on how to enjoy marine wildlife without disturbing it. Ron was asked by ESNERR to help take the lead for reorganizing their docent council, leads monthly volunteer and staff kayak tours of Elkhorn Slough, and is the lead volunteer this year in hours worked. 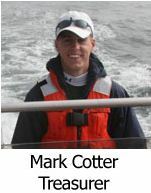 Mark Cotter is Okeanis’ Field Director and manages the California Coastal Dolphin project photo-identification catalogue for bottlenose dolphins . He holds a B.S. in Biology from the University of Massachusetts, Amherst, and is currently earning an M.S. in Marine Biology at the University of Massachusetts, Dartmouth. His research focuses on the social ecology and population biology of California coastal bottlenose dolphins. 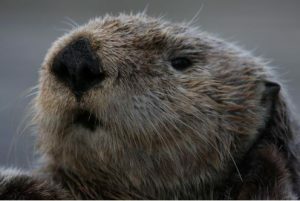 Mark also coordinates with other researchers in Okeanis’ sea otter program. Robert Scoles is not a biologist/scientist by training rather he is what was known as a “citizen scientist” in the 1800’s. After retiring from the Santa Cruz County Sheriffs’ Office, Robert rekindled a long interest in nature and wildlife by entering the guide program at the Monterey Bay Aquarium. A year later he joined TeamOCEAN, a kayak based interpretation program, run by NOAA and the Monterey Bay National Marine Sanctuary. When Robert is not volunteering with Okeanis, the Monterey Bay Aquarium, and the National Marine Sanctuary he is to be found volunteering for several literacy programs: the Santa Cruz County Jail (librarian), San Benito County Community Action Board, or as the “resident naturalist” for Family Ties, a relative caregiver program. © 2019 Okeanis. All rights reserved.